Calm down Faraday. I'm sorry you didn't win the quilt. Oooo, those teeth are impressive. Faraday: *grumbles* what there are left of them, you mean. Maxie the toothless wonder! That's what Gloman does when the annoying cartoon Blue Tax Man comes on TV. I wondered who was doing all the yelling! Hope you are entering that into FIERCEFUL YAWNING event in the Blogville Olympics , it could win a medal! 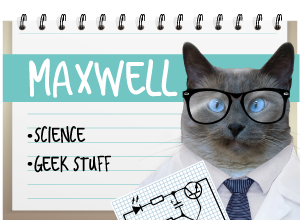 Maxwell: yup, he's always yowling about something! Great shot, paws over ears and all! 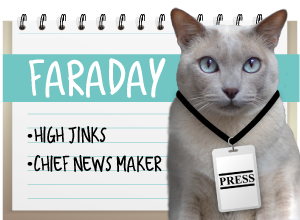 Does Faraday yowl all the time or what? It seems like he does! He & Bailey would have fun yowling together. Hey Mom? ?...what Savannah?? ?...what is that racket I keep hearing...is it coming from that blog we are commenting on?? ?...Yes Savvy...Faraday is yowling 'cuz he didn't get the quilt...what Savvy? ?...what do you mean...'sore loser'???? Seriously Faraday, chill buddy...let Ms Allie, precious darling gray and white girl, and Maxwell have some peace! 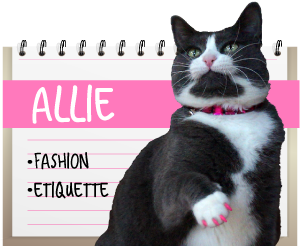 ANd the rest of the anipal blog-o-sphere!! MOL. Such a fantastic shot! ha ha - you guys always crack us up. Now are you yowling or is that a big yawn? Maxwell: that's my morning yawn-and-stretch routine. Very refreshing! Maxwell: hrm... Wonder if there was a bowl of food on top of the fridge that he wanted...! Now, I know the Admiral would have loved to sing along with him. She sure was good at that. Your teeth are super white! Do you use Crest Kitty White Strips. Wowwie! 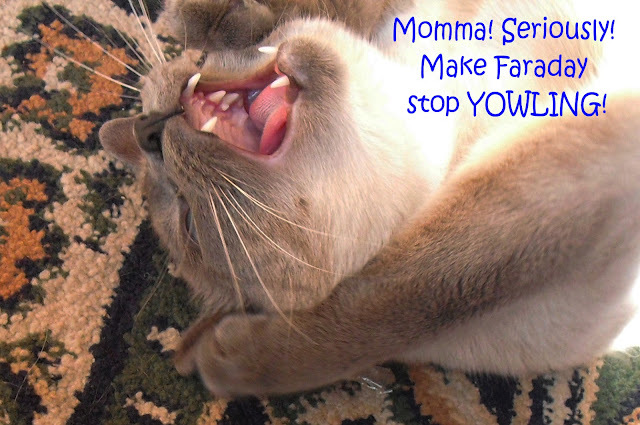 me loves yowling Siamese! Wow, he must be loud!! That's a perfect shot! Is there a scratch in your ear? And I thought my cats could be loud!